When I first moved to Vermont my son was starting first grade and I really wanted to have the same schedule as him, so when I saw an ad in the local paper for the head cook position at my son’s school I jumped at it. I had never had a job cooking before, but I knew that I loved to cook and I figured if they hired me then the rest would work itself out. Besides, having all school vacations and summers off overshadowed any second thoughts I had about applying for the position! I worked in that kitchen for a little over 4 years and needless to say, it was an interesting experience. I learned a lot doing this job, and eventually I became the Supervisor/Baker and learned how to make the rolls pictured above. 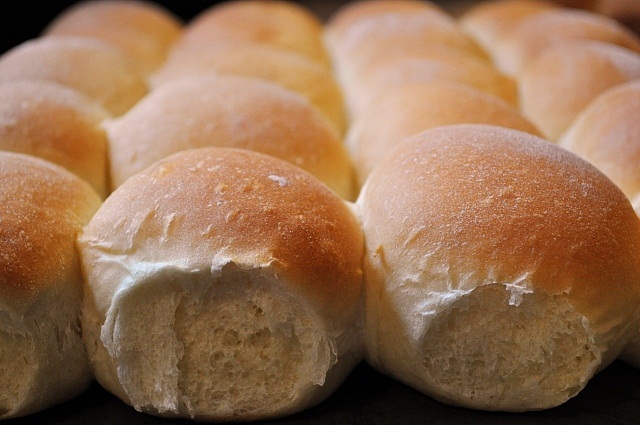 These rolls were always a big hit at the school. They are soft and delicious, and really they are just the perfect dinner roll. I make these all the time for my family and everyone loves them. So, this recipe comes from the kitchen at the little school I worked at in northern Vermont. Give them a try.....I'm sure you will enjoy them as much as we do! Dissolve yeast in warm water, and let stand 4-5 minutes. Place all dry ingredients (flour, dry milk, sugar, and salt) in mixer bowl. Using a dough hook, blend on low speed for approximately 2 minutes. Add oil and blend on low speed for 2 minutes. Add water and mix on low speed for 1 minute. Add dissolved yeast and mix on low speed for 2 minutes. On medium speed knead dough for 8 minutes, or until dough is smooth and elastic. Place dough in warm area for about an hour to rise. I usually put the dough in a large bowl sprayed with cooking spray and place it in the oven that had been turned on previously for a few minutes to get it a little warm. After the dough as double in size, punch down dough to remove air bubbles. Form rolls and place a sheet pan sprayed with cooking spray. Place in warm area until doubled in size, 30-50 minutes. Bake until lightly browned in a convection oven for about 20 minutes at 325 degrees. I keep seeing rolls recipes that use dry milk, and I always had the impression that it was because it's easier to store, so I always baked with fresh milk. But maybe it also makes the rolls softer? I think I will have to try - your rolls look wonderful! Thank you for sharing! Well, I don't have a scientific answer for you but I can tell you that when we ran out of powdered milk in the kitchen we would use fresh milk and they still came out delicious. So, I would lean more towards your original line of thinking - powdered milk would be easier to store AND cheaper, which would be important in any restaurant kitchen. There's really only one way to find out for sure - try it both ways and see if you notice a difference. Thank you for your comment, and good luck - hope you like them! Just atarted baking bread and tried my first rolls last night. They were good, but a little dense and not the soft fluffy ones I was looking for. Will try these tonight!